One and a half weeks later . . .
TELVE-YEAR-OLD CALLIOPE HAD JUST TAKEN her seat in her last-period Architecture-ology class on Friday afternoon when she heard a sound. She glanced over at Medusa, the green-skinned, snaky-haired mortal girl whose desk was next to hers. Was Medusa trying to get her attention? Or had her snakes simply been hissing? Calliope’s long wavy red hair, which was gathered in a loose ponytail at the back of her neck, bounced a bit as she nodded. “True.” Inspiring those two scrollbooks had made her kind of famous. Though not as famous as they’d made the fifteen-year-old author Homer himself! “What’s the topic?” Calliope asked matter-of-factly. She’d only begun to attend Mount Olympus Academy a month or so ago, but already she’d gotten used to fellow students asking her for ideas on this and that. Just thinking about Homer made Calliope sigh dreamily. He had such a great vocabulary and was so incredibly talented. And she adored his cute spiky blue hair. But, unfortunately, she could only crush on him from afar. Because except for when she’d been helping him with his books, he seemed totally blind to the fact that she was even alive! Medusa leaned toward Calliope again. “Well?” Emphasizing her request, the snakes on top of her head curved themselves into a dozen scaly, green question marks. “Maybe,” Medusa said with a shrug. If her snakes had had shoulders, they probably would have shrugged too. “Got any other ideas?” she asked. Calliope didn’t mind that her first idea didn’t appeal to Medusa much. Sometimes it took a few tries to hit on the very thing that would catch someone’s interest and generate true inspiration! Her brown eyes lit up as a new idea came to her. “Good afternoon, class,” interrupted their Architecture-ology teacher, Mr. Libon. He’d stood up from his desk at the front of the room, wearing his usual sandals, which each had a single tassel for decoration. Though he was medium height, he looked plumper than he really was because he wore a tunic with dozens of pockets, each filled with drawing tools. He could whip out just about anything you needed in an instant—flat triangles of different sizes and angles, templates with shaped cutouts, or a pointy scissors-like thing called a compass for drawing any size circle. Having gotten everyone’s attention, the teacher sat down again and began digging around in the stuff atop his desk, obviously trying to find something. Good luck with that! As usual, his desk was overflowing with planscrolls and small-scale models of temples, houses, and other buildings. In addition to teaching, he was famed for designing and building Zeus’s temple in Olympia. There was a golden statue of Zeus inside it that was one of the Seven Wonders of the Ancient World! On the wall behind Mr. Libon’s chair were numerous hand-lettered signs with encouraging or funny slogans. BE THE ARCHITECT OF YOUR BEST FUTURE. ARCHITECTURE NEVER FALLS DOWN ON THE JOB. IF YOU HIT A BRICK WALL, BUILD A DOOR THROUGH IT. Cool, thought Calliope. Tonight wasn’t going to be all about Medusa’s need for ideas, though. The unsuspecting snaky-haired girl didn’t know that Calliope had recently decided to “interview” roommates. Because she didn’t have one yet. And she’d heard that Medusa didn’t either. Calliope had been rooming by herself in the dorm ever since she’d arrived at MOA, and she didn’t like it one bit. She missed her eight sisters—well, the seven who were not at the Academy, anyway. She still got to see her oldest sister, Muse Urania, almost daily since she taught Science-ology at the school. Unfortunately, sometimes Urania acted like she thought she was Calliope’s mom. Urania was twenty-six years old, so she was fourteen years older than Calliope! 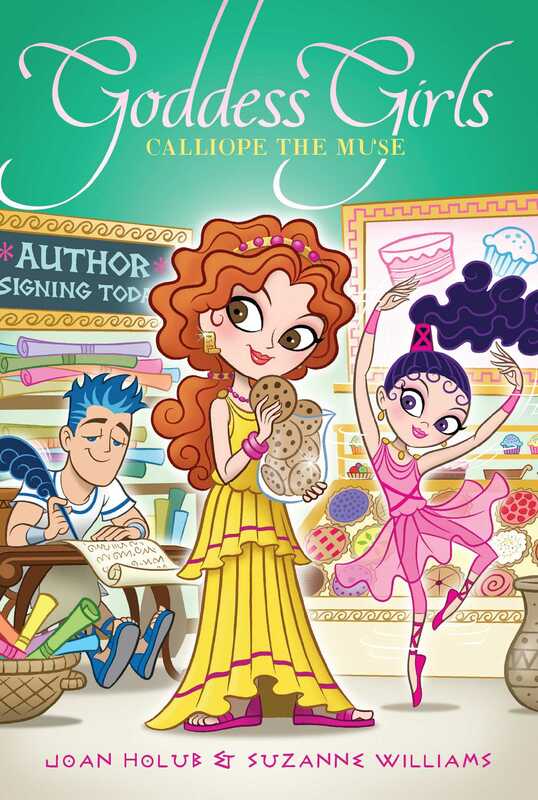 As Mr. Libon began to talk about the design projects that would be due next Wednesday—individual projects they’d been working on since Calliope had first started at MOA—she shot Medusa a look. Would the green-skinned girl make a good roommate? Hopefully, tonight’s meeting would help Calliope decide. If it seemed like they’d be a good match, she could ask Medusa to sleep over sometime. She wasn’t going to rush into anything. She wanted just the right person, someone who would be a good friend and not boss her around like Urania and some of her other sisters tended to do. They meant well, but hello? She wasn’t a baby anymore. Yikes! A flurry of panic swirled inside Calliope’s chest. She hoped he wouldn’t call on her first. With luck, maybe the lyrebell would ring before he got to her. Because the thing was, she wasn’t as far along on her project as she had hoped she would be by now. Hands shot into the air. But Calliope’s wasn’t one of them. Sad to say, but as of today she still hadn’t come up with a design! And that was news she didn’t want to share, thank you very much. Mr. Libon called on a godboy with blond hair and light turquoise skin named Poseidon. Grasping his planscroll, Poseidon stood. Then he strode confidently to the front of the room. Snap! With a flick of his wrist he unrolled the planscroll. “I’ve designed a new water park,” he said proudly. “It’ll be as cool as the one I built in Athens but with even more slides, more fountains, and more pools.” As he spoke, he pointed to places on his scroll where he planned to add the additional features. He’d used a spiral symbol to represent the slides, triangles to represent the fountains, and circles to represent the pools. “Awesome!” a godboy named Dionysus exclaimed, pumping a fist in the air. Several other students also made noises of approval. Calliope had been to Poseidon’s water park in Athens, and it was indeed fantastic, with gracefully curving slides made of polished marble, tons of fountains, and pools of turquoise water topped with lily pads. It also had real mermaids, mermen, and sea monsters! But it seemed to her that just adding more of the same kinds of features wouldn’t be enough to make this new water park stand out. It seemed that no one did, or maybe they were all just anxious for their turns to speak. If students did have a project ready, it was a good idea to get a critique now. Just in case their plan was a dud or had drawbacks they were unaware of. Poseidon sat down, and Mr. Libon called on Amphitrite next. Her desk was right in front of Calliope’s. As Amphitrite stepped with her planscroll to the front of the room, Calliope thought how hard it would be for anyone to guess that the turquoise-haired girl was a Nereid—a nymph of the sea. After all, most of the time she was at MOA, she walked around on two legs. When she was in water, though, her gold-colored chiton transformed into a golden-scaled tail and she became a mergirl. Calliope had seen it happen during a swim night at the Academy pool a week ago. Like Calliope, Amphitrite hadn’t been at MOA for long. Long enough to have a crush, though, judging from the smiles she and Poseidon traded in class all the time. Calliope planted her elbow on her desktop, set her chin in her palm, and thought wistfully of Homer again as Amphitrite began to speak. The sea nymph’s planscroll showed detailed sketches for a landscaping project—a lush and beautiful undersea garden. “I designed it to surround a golden palace at the bottom of the Aegean Sea,” Amphitrite told the class in her bubbly voice. “A palace being built in my honor by inhabitants of the sea,” Poseidon interrupted her to boast. Amphitrite smiled at him. Again. As godboy of the sea, Poseidon saw to the welfare of all sea creatures, so it made sense that they would build a palace in his honor. And Calliope could understand why he would be proud of it. Pointing to each of the triangular sections in turn, she described the plants that would populate each of the five garden areas. She’d planned a coral garden, a garden dominated by various sea grasses, a rock garden designed to look like a series of tide pools, a garden of brightly colored plants and simple animals such as sea cucumbers, and a garden with a treasure chest theme that included sand dollars and oysters with pearls. Poseidon started clapping the minute she’d finished. “Pure genius!” he proclaimed admiringly. I’d give anything to have Homer speak so highly of me, thought Calliope. However such admiring words had never passed his lips—not headed in her direction, anyway. Several other students gave suggestions this time too, including Medusa. She thought a garden with a sea snake and eel habitat might be nice. Her snakes bobbed their heads in agreement. When the period ended without Calliope being asked to share her (as yet nonexistent) project, she jumped up in relief. She grabbed her schoolbag and headed for the door. Calliope froze in her tracks and swung back around to look at him. “Um. Okay,” she said. Feeling nervous about what he could want, she went up to his desk and stood there fiddling with her bag. She had decorated it with the names of famous epic poets, such as Hesiod, Asius of Samos, Eumelus of Corinth, Panyassis, and—most important—Homer. She relaxed a little when Mr. Libon smiled at her. “I really appreciate the great feedback and suggestions you give others in class,” he began. “Thanks,” she said, relaxing even more. “It’s easy for me. Being a Muse and all.” As Muses, she and her eight sisters served as sources of inspiration to others for all kinds of creativity in the arts and sciences. “For . . . for anyone who likes awesome buildings!” Calliope answered, smiling brightly. “I don’t suppose you have a planscroll for this awesome building, do you?” Mr. Libon asked. He gestured at her schoolbag. “I do understand,” Mr. Libon said sympathetically. “But as you know, your project is due on Wednesday, and it’s worth eighty percent of your grade. You haven’t got that much time. So my advice to you is to choose the idea or ideas that appeal to you most right now and go with them. That’s what architects do in the end. A bunch of amazing ideas that aren’t ever put to paper will never a building make.” He paused and scribbled down the words he’d just said, probably planning to make another handwritten sign for his wall. When he’d finished writing, he glanced at her again. “Muse Urania is your older sister, isn’t that right?” he asked. “What? No!” Calliope exclaimed, shaking her head so hard that her ponytail almost came undone. The last thing she needed was to have her sister nosing around in her life. She loved Urania, and her other sisters too. But despite the fact that Calliope was twelve years old now, they still treated her like she was five most of the time. In other words, they were a little too into her business. “Oh, sure. Yeah. I will,” Calliope assured him, starting to ease toward the doorway. But all the while she was thinking, Not a chance! At last she reached the exit. “Okay, well, thanks, Mr. Libon.” She ducked out fast. Once through the doorway, she breathed a sigh of relief. Out in the hallway a sense of determination filled her. The very minute she got to her dorm room, she was going to sit down at her desk. She’d let nothing stop her from getting this project going. For real this time. She was going to narrow down her ideas to the very best one and get started on a design for a house or a temple or whatever. She didn’t really care if her design was the one chosen to be built, she thought as she started down the hall. Her goal at this point was simply to get the project done so she could pass Architecture-ology with a decent grade. Because if her sisters ever found out that she was struggling in a class, they’d forever be checking up on her. And more than anything else, she wanted to stand on her own two feet, to have them see her as the almost-teenager she was!